RN submarine seamanship strikes (almost) again. Thread: RN submarine seamanship strikes (almost) again. Re: RN submarine seamanship strikes (almost) again. OK, it was nasty and vindictive but, national pride and a fantastic propaganda opportunity apart, were the Germans wrong in law? He was a civilian and he attacked an enemy vessel, after all. Ramming them is self defence in my book. As you'll see, its track is predictable within a band about a mile wide. Anyone waiting invisibly within that band is just asking for trouble. That last paragraph is just a stupid comment. It also doesn't explain your comment about lookut in the RN. Last edited by East Cardinal; 24-01-19 at 14:22. Surely the sub was probably heading North or south so crossing the ferry route, if he could not see the ferry and monitor its position adjusting his speed accordingly there must be something seriously wrong. Some one spotted his periscope and told the ferry captain who logged it. There is no suggestion of any danger? A few years back on passage from Carrick to Gigha on a really sunny but cold morning we encountered a thick layer of mist, could see about 5 boat lengths but it is hard to judge, getting nervous as we were approaching the Larne Cairnryan ferry route, the boat suddenly lifted about 6 feet and slapped down again and there was the roar of the engines of the HSS, both seemed to happen simultaneously indicating he had been very close, seemed to be going flat out past us but we never saw him. I more or less convinced myself that the layer of mist was thin enough that the top of our mast was visible above the mist or he would not have passed so fast and close, alternatively he just never knew we were there. I thought that's what submarines do? MRDA: Mandy Rice-Davies applies. Though I suspect that in a collision between a Stena ferry and a submarine, the submarine would have the rougher time. That all depends, in this case the ferry would have been hit by the fin which is toughened for breaking through polar ice, might make a chunky hole in a ferry which could be problematic. On the other hand the submarines watertight integrity would not be affected though quite a bit of repair work would be in order. A stupid comment? 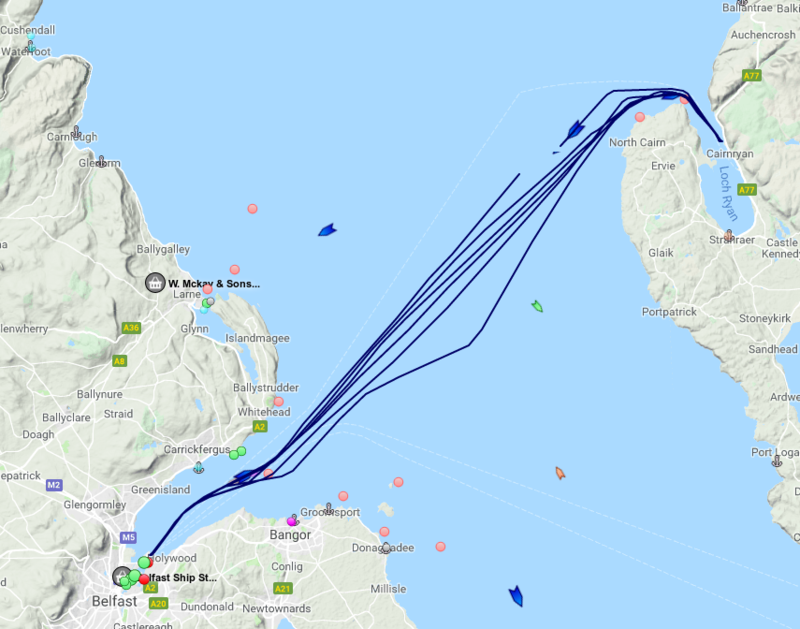 You honestly think it is sensible to lurk in a near-invisible boat in the middle of a busy shipping area, and worse than that in the middle of a track through that area used by large vessels many times per day. Even if the crew didn't have the sense to check the charts, they should have been able to detect the ferry miles away and keep well clear. Failure to do so is a clear breach of IRPCS. "Seamen are always wanting to do things the proper way; and I like to do them my way." The MAIB investigation suggests that they are taking it rather more seriously that "Ooooh, a periscope". Quite apart from that, had the ferry made a late course change - as it was perfectly entitled to do - that safe distance could easily have vanished. It would be interesting to know how many of those - not you - defending the sardines would also defend someone who crossed the North Channel at night in an unlit small yacht and had a near miss with a ferry. I think they spend most of their time skulking in deep water, ready to commit genocide for the Queen. True, but the fin isn't that big, is it, and those ferries are quite deep. "A Submarine at periscope depth will not close to within 1500yds of an FV without her specific consent." I'm guessing that's the same for a ferry? Seems fairly obvious that something's gone awry if the ferry got a scare. A cover up by denial of the distances, a reprimand or a new career selling ice cream near Helensburgh for 'an' Officer? What's your call JumbleD? The big question is "What the hell was a submarine playing at, lurking at periscope depth on a busy shipping route?" What evidence do you have that the sub was "lurking" and not making way on a N/S passage? Either you have some more facts than have been disclosed in this thread, or you are perhaps letting your prejudices run away with you a bit? You obviously have some axe to grind on this topic. Without the report I expect we cannot know exactly the circumstances. But IRCPS does not give ferries right of way because they use the same routing on each trip. All times are GMT. The time now is 10:18.